Those glaciers are melting, gouging lagoons into the earth behind them as they retreat, and everything in Höfn is slowly changing. Out-of-towners have to be shown new ways to the ice caves. Farmers who have taken sheep across the tops of the glaciers to pasture for centuries need to find new routes. Children must stare down an increasingly uncertain economic future. Jackson wants to change that. A Fulbright scholar who lectures and leads tours for National Geographic, she is focusing her doctoral work in the UO’s geography department on a new approach to studying glaciers and climate change that includes qualitative information—firsthand observation, anecdotes, photos, and folklore—alongside the traditional quantitative data. 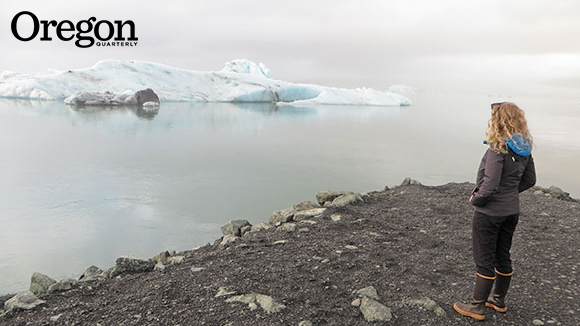 Jackson’s fieldwork in Iceland was funded by a nine-month Fulbright Arctic Initiative research grant—her second glacier-related Fulbright—as well as by the National Science Foundation. To observe, she immersed. She participated in search and rescue, helped run a guest house, and worked at a research station. She formally interviewed more than 200 people and even collected children’s lullabies that reference the glaciers’ scary moans. Why is this memory important? Because every glacier is different, and every community is affected differently as its glacier melts. Jackson found that in Höfn, melting ice even triggered restlessness in local teenagers. Heavy glaciers once pressed the land like a hand on a sponge. As the glaciers melt, the ground bounces back, a phenomenon called isostatic rebound. Now, the fishing boats are scraping the bottom of the entrance to Höfn’s harbor. Between threats to the fishing and tourist trades, Jackson found, the youth of Höfn are worried about their futures if they stay in town. As Jackson has discovered, innovative approaches to studying climate change can stir up controversy in the United States. A paper she coauthored with her other cochair, Mark Carey, UO associate professor of environmental history, emphasized the importance of incorporating female and indigenous perspectives, even those expressed in the humanities and social sciences, when developing responses to climate change. Called “Glaciers, Gender, and Science: A Feminist Glaciology Framework for Global Environmental Change Research,” the paper triggered the ire of conservative pundits when it was published earlier this year. That criticism, in turn, made Jackson the target of a wave of online harassment, which quickly turned misogynist and distracting. They have centuries of folk wisdom to back them up—and yet they’re wrong, she muses. “It’s part of the glaciers’ natural rhythms to oscillate, to get bigger and smaller. Some don’t think there’s a link between a glacier getting smaller today and climate change because they have firsthand accounts all the way back to the ninth century that the glacier does this. John Strieder, a writer and video producer, is a master’s degree student in multimedia journalism.